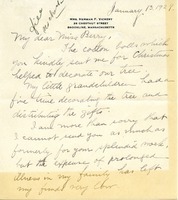 Letter from Mrs. Annie L. Vickery thanking Miss Berry for the Cotton Bolls which her grandchildren used to decorate the Christmas tree and to distribute as gifts. 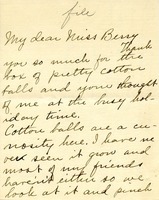 Mrs. Watson thanks Martha Berry for the box of cotton balls and says she showed them off to her friends. 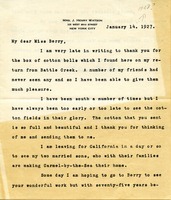 She also tells Martha Berry that she is leaving for California in a day to visit her two sons. 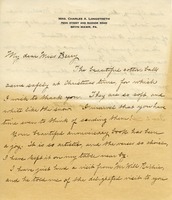 Annie Thorp writes Martha Berry to thank her for the gift of cotton balls and to discuss the warm winter she was experiencing in Cambridge, MA. 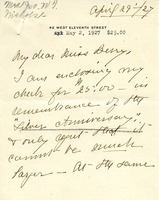 Thank you letter for the cotton balls sent by Martha Berry. 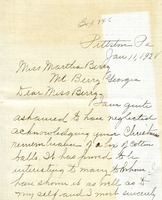 The letter is to Miss Martha Berry to thank her for the cotton balls that were received at Christmas time. There is also the mention of a beautiful anniversary book that was also received. 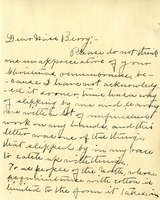 There is a notation of a conversation with Will Richie who told of a visit with Miss Berry as he was returning home from Florida with his mother and son. 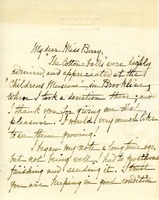 Hannah H. Kimball informs Martha Berry that the cotton balls were well received when she showed them at the Children's Museum in Brookline. 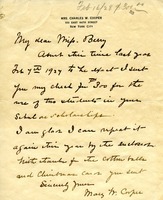 Mrs. Mary W. Cooper sends money for scholarships to Martha Berry and thanks her for the cotton balls and Christmas card she received. Mr. Willard thanks Miss Berry for the package of cotton balls and him and his wife sends her best wishes for the New Year. 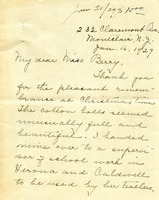 Mary Nevius writes to Martha Berry thanking her for the gift of cotton balls she received from the Berry Schools during the holiday season. She briefly talks about her fascination with cotton balls, her intention to send clothing to the Schools, her hopes that the new dormitory has been completed, and her dismay at having been snowed into her house for the last few days. Jennie writes to Martha apologizing for not writing sooner, as time has way of skipping away. Jennie also inquires about the moving pictures for a Church Organization in February, as she believes they would be great in getting more support for the Berry Schools.